I talk about Korean skin care all the time. I just taught another Beauty 101 class, and all the ladies were asking me about K-Beauty and which products I used and what all these things men, so in their honor, here is a blogpost dedicated to breaking down the parts of Korean Skin Care. Korean women are considered to have the best skin in the world, and obsess over which products they use. Making the change to Korean products has been the best thing I have ever done for my skin and it has never looked better. South Korea is not only the mecca of skin care it is actually the world leader in research and development of skin care products. Korean skin care utilizes technologies we don’t have yet in America, so these products are really high performance and give you absolutely amazing results. The Korean skin care system is based on layering products and targeting very specific skin concerns. I added each category of product in one at a time so that I could see if they made a difference, and if layering them was worth it. It was. The following post is a break down of each of the main components that make up the Korean skin care regimen. You can use them all, or if that is too overwhelming just pick and choose the parts that work for you. You can find Korean skin care in various stores (such as Sephora), or you can order them online. I buy online from Memebox, the largest purveyor of Korean skin care products. They are based in the San Francisco area so everything ships out quickly and arrives in 3 – 5 days. I write about Korean skin care and Memebox often, and normally post about my orders when they arrive. If you go to the search bar and type in either Memebox or Korean skin care you will get a list of them all. Korean Skin Care – Where Do You Begin?? Disclaimer: Memebox does not sponsor this blog and does not give me free product. I buy every product I talk about, show you, or use. I do have affiliate marketing with Memebox through a third party. This means that if you order from any of the links in this post my blog may earn a few cents. One of my recent Memebox orders. All these amazing products for around $100! The Korean skin cleanse is actually a two step process. One cleanse to dissolve makeup, the second to clean the skin. Personally I just do a single step cleanse, using a cleansing oil. I use I’m Cleansing Oil from Memebox. It dissolves makeup (even waterproof mascara!) and leaves my skin feeling super soft and supple. You should cleanse your skin with a product designed for your skin type. If you have oily skin or get breakouts you need cleansing products designed to lift away excess sebum and help deep cleanse the complexion. If you have dry, irritated or sensitive skin you need very gentle cleansing products. Find Korean cleaning products here. The next step in the Korean skin care system is the exfoliation. From scrubs to enzyme masks to peels, the pathway to smooth, glowing skin is exfoliation. Be careful not to exfoliate too frequently or too aggressively, and choose the formulation you need to meet your skin type. Sensitive and irritated skins need to be especially careful because aggressive or abrasive exfoliators can make skin even more sensitive and irritated. Exfoliating every couple of weeks is ideal for most skins. After cleansing your skin the next daily step is a refresher. That can be a facial mist (my favorite) or a softening toner. The refresher softens and prepares the skin for the treatment and moisturizing products that follow. Korean women consider this to be the most important step in their skin care regime. Essences combine multiple intensive ingredients into a super concentrated form (you really only need one drop) and then transports them deep into the skin. They are lightweight in texture, so the surface of your skin doesn’t feel slimy or oily, and they are skin concern specific, so you target the issues that you want to work on. Aging/dehydration/acne/excess oil/lightening and brightening – you name it there’s an essence for it. You can also layer essences and tackle multiple skin issues at the same time. An ampoule is a super-charged, highly concentrated serum that again you only need a tiny amount of and that go super deep into the skin (much deeper than the average serum or moisturizer). Again this product is skin concern specific. You look at what you want to fix about your skin, whether its smoothing the texture, brightening, super hydrating, anti aging – you name it there’s an ampoule for it. The results are sensational and your skin will love you for adding ampoule into daily routine! If you are using both an essence and an ampoule the essence goes on first. So far if you are doing all the steps in the Korean system you have been targeting skin concerns and deep treating them. Now it’s time to start moisturizing the skin. Emulsions are lightweight moisturizers. You can use them alone, or as the next step after your ampoule. They give you all the moisturizing that you need without being really heavy on the skin. Korean women really understand the importance of super moisturizing the skin to keep it soft, supple, glowing and healthy, so at night after all these steps they apply a sleeping pack, which seals all the prior products in for the night. A sleeping pack has a similar texture to a night cream, but is slightly more gel-like. It doesn’t leave a film on your skin, doesn’t mess up your pillow case, it just absorbs in and makes the magic happen! Every week you should do a mask, whether it’s for hydration, brightening, clearing blackheads, cleaning your skin, or whichever issue you want extra help with. Sheet masks are great because they get a completely even coating of product and seal it into the skin. Also they’re not messy, which I love. If you are not a sheet mask girl Korean skin care is full of regular mask options too. 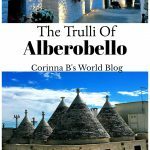 Previous Post Exploring Puglia ~ What are Trulli?